So I’ve been neglecting some of you and I’m sorry – but you’ll be happy to know that ends today. 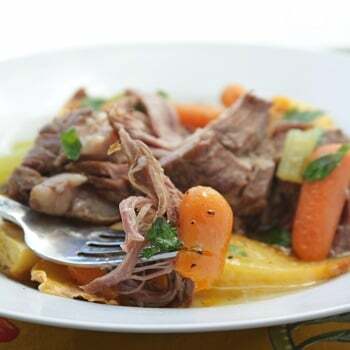 Many of you have been requesting crock pot/slow cooker recipes, and I’m finally getting around to it – starting with this fantastic Easy Paleo Pot Roast recipe! Truth is, I’ve never been a big crock pot user. I have 2 of them – but they stay buried deep in my cabinets, unless I’m making homemade greek yogurt. I think the last time I actually cooked a meal in one was at least three years ago, if not longer. But it’s not that I don’t like them, I just never think of it. Also, I don’t always plan my meals way ahead, so for me it’s usually easier to see what I have in the fridge and throw something together for dinner on the fly. There is something to be said for the “set it and forget it” convenience of a crock pot though. Walking in after a long day of work or school to a delicious smelling home and a meal ready to serve definitely has it’s perks! In addition, it doesn’t have to be an elaborate recipe to taste amazing. Take this Easy Paleo Pot Roast recipe for example, I made it simple on purpose, just to see how it would come out. Well the verdict is in – it’s delicious, hearty, and Whole 30 compliant – does it get any better than that?? I think not. One issue I’ve always had with crock pot cooking is having to brown the meat first, saute onions, or whatever. It always seemed like if I was going to dirty a pot anyway, why not just cook my meal in it? Some of the recipes I have coming up don’t require that extra step, this one I’m afraid, does. You really need to sear your meat to get some flavor in the broth. I suppose it will still work if you don’t, but you simply won’t get the same depth of flavor – it’s basic chemistry here. I roasted my rutabaga separately and served it with the pot roast, but you could also add it directly to the pot during cooking to make things easier. The one thing I would have added had I not been doing the Whole 30 this month is some red wine. 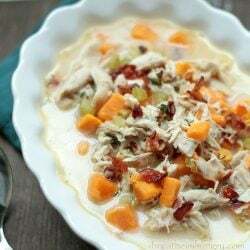 If you are low carb, you can omit the carrots and serve this over a cauliflower mash – maybe a splash of heavy cream….awesome. You can also add mushrooms if that’s your thing (I recommend sprinkling some fresh thyme over it before serving if you do – because thyme and mushrooms are sublime together). And as always, we love hearing about your concoctions, so please do share in the comments if you have a favorite pot roast version of your own! A super simple and versatile pot roast recipe that is Whole 30 compliant! Add everything but the parsley to the pot and cover. Cook on high for five hours. Taste and season with salt and pepper as desired. Serve garnished with fresh parsley over roasted rutabaga, cauliflower puree, or the side of your choice. 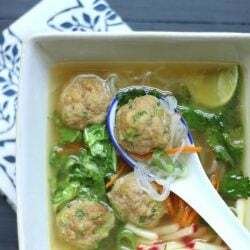 Also, you don’t need a crock pot or slow cooker to make this recipe – if you choose, you can add all of the ingredients to a large pot and simmer on the stove (low heat), covered, for about 3 hours or until the meat is tender. Enjoy! Delicious and easy. The meat just fell apart! I added string beans and potatoes as I use a lot of paleo recipes for my GF/DF daughter. I did add the optional 1 cup red wine and that was my kids’ only complaint. I think a whole cup was too much and that was even diluted with a whole box of broth. I don’t know anything about wine but maybe I used too good of a bottle for it to come out so strong? If it’s 5-6 for high, how long would it be for low? Thank you for your delicious Whole 30 recipes! Just put roast in crock pot and waiting for Dinner. Thank you for all your delicious recipes. I’ve used many of them and they have all been delicious. I read some of the comments and noticed that one person was quite annoyed with popups. I ignore the popups and close as I go. Would not relinquish your website for that and all the choices that you make available for us, who are trying to loose weight and eat healthy. Thank you and Blessings. This was an amazing roast! i added the cup of cooking wine after checking it’s label and seeing it had one carb. it added a lot of flavor and the whole house smelled incredible. i added mushrooms, carrots, celery, garlic cloves and boiling onions. about an hour before serving i added small heirloom potatoes for those who wanted them. they were perfect and didn’t fall apart into the broth so guests could have them or not depending on their preference. 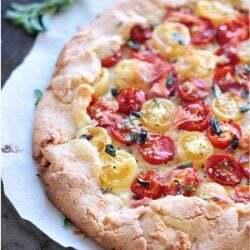 i love this recipe and will do it again for sure! Thanks! Hi is this really supposed to be on HIGH for 5-6 hrs? 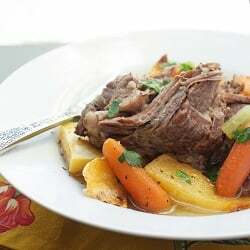 This looks delicious and I want to make it today, I just want to make sure that’s not a typo because it seems like other recipes I’ve done for pot roast say to cook it on low for a few hours. Thanks! Was craving pot roast and knew I had a few pinned. I’m not much of a cook at all. (Though I have been trying pretty hard since I learned about paleo last year). This one honestly looked the easiest. I went in SAMs but didn’t want to get 6 pounds of meat so I ended up with 2 pounds of step 4 chuck roast from whole foods. (The only option they had and I didn’t want to go in a third store.)Omg! With 1 1/2 cups homemade bone broth, 1 cup cheap Cabernet, extra garlic and onions, and plenty of carrots this was sooo easy and tasty! I served it over mashed sweet potatoes and I didn’t want to stop eating it. The meat wasn’t cheap but I will definitely make this exactly the same way again. I was honestly pretty proud of myself for this meal. Thank you! While the recipe was Devine, your website was horrific. While viewing it on my phone there were constant pop ups prompting me to support my child’s nutrition wih Enfamil formula and it constantly switched over to the App Store to download random games. It was a terrible experience and I’ll not be coming back. There’s no reason to attack visitors with that junk. Thanks for the feedback Isabella! The current site design has a lot of issues especially on mobile (even I can’t stand using it on my phone!). The developer will be ready with the brand new site in a couple more days (so I’m told) and I hope you’ll check back and give us another chance once we relaunch! Thanks! It is Whole 30 compliant. The wine is optional, which is clearly listed in the recipe as such for those who are NOT doing the Whole 30 and would prefer to add it. Hi there, this sounds amazing. I am learning to use my crock pot – difficult to find low-carb, clean recipes. 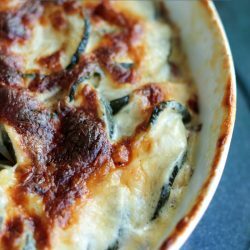 Quick question, in the blog you mention a dash of heavy cream – do you mean to add the cream to the crock pot with the other ingredients, or when ready to serve , or to the cauli mash? Thanks! It’s been so long since I posted this that I don’t really remember, but it may have been to add to the juices to make it more like a gravy, which I’ve done before. I was on the whole 30’at the time which is dairy free so that was probably it! Enjoy! Thank you so much! Huge hit at our house. I am making it again, but my roast is 5 lbs, and I would like to cook it on low. Is there a reason to cook it on high for five instead of low for 8? Thank you so much for taking the time to respond. 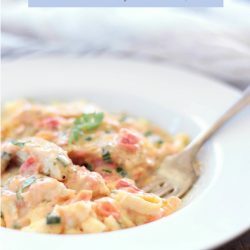 I am starting Atkins Induction tomorrow so I am excited to make this again. Thank you! Either one works, it just depends on how fast you want it done or how long you’re going to be gone, etc. This recipe was spot on. Used chicken and beef broth in this. My husband said it’s the best roast he’s ever had. Wonderful addition to our Whole30 recipes. THANKS!! I was thinking about adding potatoes to this. Have you done this? And if so, do you recommend putting them in with the rest of the ingredients? Hi there! 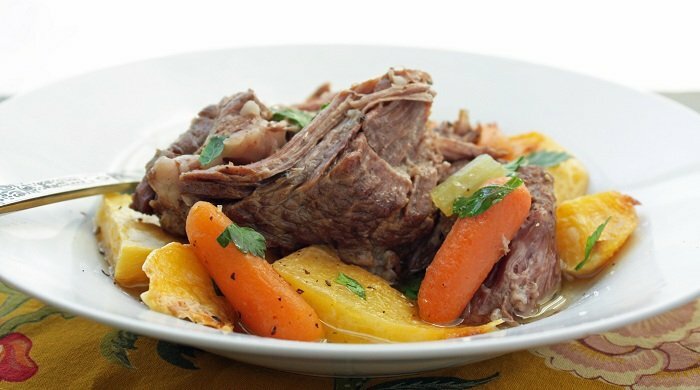 I have been trying to find a pot roast recipe for ages that doesn’t include the use of canned soup. 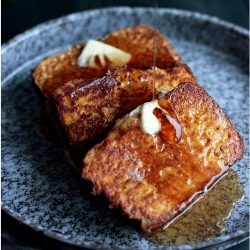 This recipe looks great, I will be trying it tonight. Thank you! Hope you like it Christine! It was a real hit over at our house! I love using my slow cooker and coming home to a hot dinner! Just love cooking with Crock Pots/Slow Cookers and have had my original one for about 30 yrs. I was also given a 2nd newer model (but would you believe I prefer the older style one) I have also now got my daughter onto using them. Just so handy. I am yet to have a disaster when using a slow cooker. 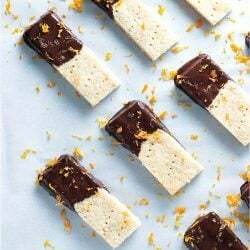 Whilst it is summer here now, this recipe will definitely be getting a whirl as soon as the cooler weather appears. Thanks for always sharing such wonderful tasty recipes. Thanks! I seriously want to lick my monitor each time one of your email updates comes through. Yummmmmmy photos. 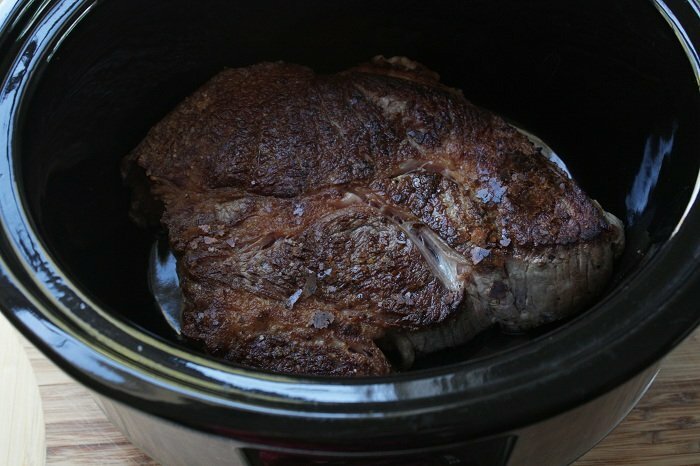 I’ve got a roast in my fridge right now and this is the perfect recipe as I love my crockpot!